4 season beautiful cozy family entertaining cottage on the Ottawa river. 350 feet of Water Front, Dock available, Boat Launch nearby, Great Fishing and Amazing swimming! - Large great room beside dining room with fabulous view. - Top of the line appliances and a quartz Island highlight the Chefs Kitchen. - Massive deck with glass railings and sun exposure all day! - In floor Radiant Heat provides comfort and luxury to the polished concrete floors. Upstairs has 2 bedrooms. Master is a King Bed and 2nd is a Queen room. Downstairs has 3 custom bedrooms. 2 are Bunk Bedrooms; Double beds over Queen Beds. 1 is a loft bed ( Entire 9 feet across the room) made with a king and Twin bed. The loft is pictured with a Queen Blow up bed under it as well. All beds are new 1 year and covered. We Built this as a family cottage for our young family and we love it. We can't make it up there all the time due to life, so we thought we may as well try and cover a few of the costs and let others enjoy it! We are quite proud of it and so far the feedback has been exceptional! The Waterfront and view are spectacular. The cottage and 2 acres of land will continually evolve but the waterfront is amazing. Soft sand gradual entry on one side of the property and on the other side a rocky deep dive! This cottage has been built for fun, for the young and young at heart. We entertain a lot and would love for others to enjoy it as much as we and our friends and family do. Full dining room upstairs but second dining area downstairs good for kids and extras. Beautiful large deck with glass rails that look to expansive river view. Mount Chili is 15 mins Door to door. Quaint and quiet ski hill with T-Bar. Beautiful place with a beautiful view! Mark’s cottage was amazing. My family and I enjoyed every minute of our stay there during the Christmas holidays. 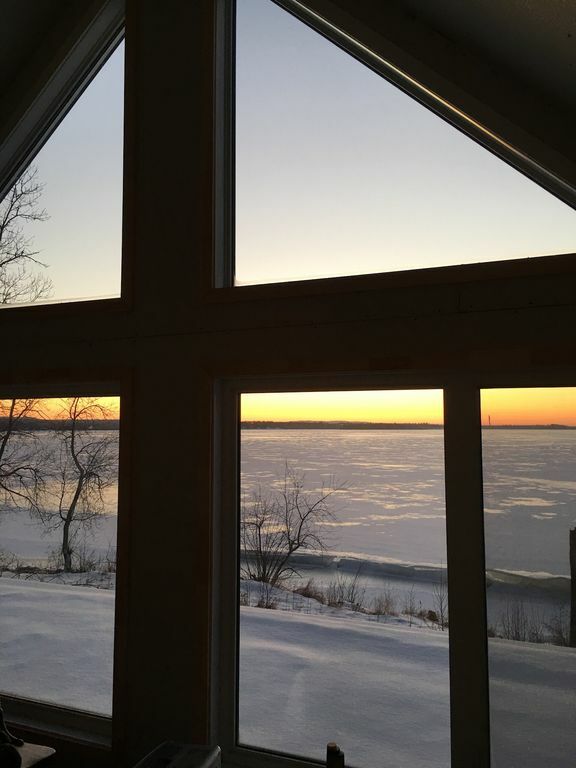 From the moment you step into the living room, the view of the lake is spectacular! Simply breathtaking. The cottage was so spacious and the kitchen and the kitchen appliances were superb! The huge custom made bunk beds in the 3 rooms were perfect to accomodate a big family. The 2 rooms upstairs were also perfect. Mark was a great host. Very accommodating and pleasant. I would definitely recommend this cottage to anyone. Our family of 11 spent the Thanksgiving weekend in great comfort at Mark's. His spacious home gave us a place to prepare our turkey in modern appliances, gather at a table together to enjoy good food and the company of family as we looked out at a breathtaking view of the Ottawa River and sleep in comfortable beds at night. The outside activities included walks along the wooded road, fishing on the river and enjoying the property around his home. The cottage is lovely and very comfortable. We stayed for three nights and found the pictures are quite accurate and everything to be very clean. The view on the main level is stunning and the hosts even had a telescope for star gazing. We felt very much at home and would definitely rent this place again. WE went up for a six day stay on the river to do some fishing. Excellent location and the house is perfectly outfitted. Brand new appliances, beautiful shoreline. The deck with glass railing was perfect for taking in the sights. Overall, a great experience !